The electoral reform bill has passed a second reading, so we will almost definitely have a referendum on the Alternative Vote system next year. Forget accusations of “gerrymandering”, because the referendum isn’t about the proposed boundary changes, only the way we vote. I will also be attending the Green Party Conference on Saturday, when they will be debating whether they should back a “Yes” or “No” vote at the referendum. Now therefore seems a suitable time to explain why you should all vote Yes. I want to get involved in the Yes campaign, so see this as a statement of intent, if you like. 1) People who don’t think First Past the Post is better than AV. 2) People who would prefer a more proportional voting system and do not think voting Yes offers any benefits to them. I’ll discuss both those points in turn. First, I’ll just explain how the First Past the Post (FPTP) and Alternative Vote (AV) systems work, courtesy of the Electoral Reform Society. Both of the articles on their site are rather partial, as you’d expect, but provide excellent summaries on the two different methods of electing a government. FPTP voting takes place in single-member constituencies. To vote under FPTP, the voter simply puts a cross in a box next to one candidate. The candidate with the most votes in the constituency wins. The Alternative Vote (AV) is very much like First-Past-the-Post (FPTP). Like FPTP, it is used to elect representatives for single-member constituencies, except that rather than simply marking one solitary ‘X’ on the ballot paper, the voter has the chance to rank the candidates on offer. The voter thus puts a ‘1’ by their first-preference candidate, and can continue, if they wish, to put a ‘2’ by their second-preference, and so on, until they don’t care anymore or they run out of names. In some AV elections, such as most Australian elections, electors are required to rank all candidates. If a candidate receives a majority of first-preference votes (more people put them as number one than all the rest combined), then they are elected. If no candidate gains a majority on first preferences, then the second-preference votes of the candidate who finished last on the first count are redistributed. This process is repeated until someone gets over 50 per cent. It may look a bit more complicated at first glance. But all a voter has to do his rank the candidates in order from 1 to 5, or 6, or whatever. So it really isn’t that hard, is it? Anyone who complains that AV is overly complicated obviously doesn’t really respect the intelligence of the general public, which seems a bit patronising to me. Our present democracy was made for a two party system. Look at the structure of the House of Commons, for instance: it’s adversial, and designed for two parties to sit opposite each other, bickering and throwing rotten fruit across the chamber. Since 1832 the system has served its purpose because generally British Politics has been about two parties. In the nineteenth century these two parties were Liberal and Conservative, then in the first decades of the twentieth century the collapse of the Liberals ushered in Labour to be the second of the two main parties. In 1951, for instance, Labour and the Conservatives got between them 96.8% of the vote. The number of Lib Dem votes increased in May, but ended up with seven less seats than 2005. 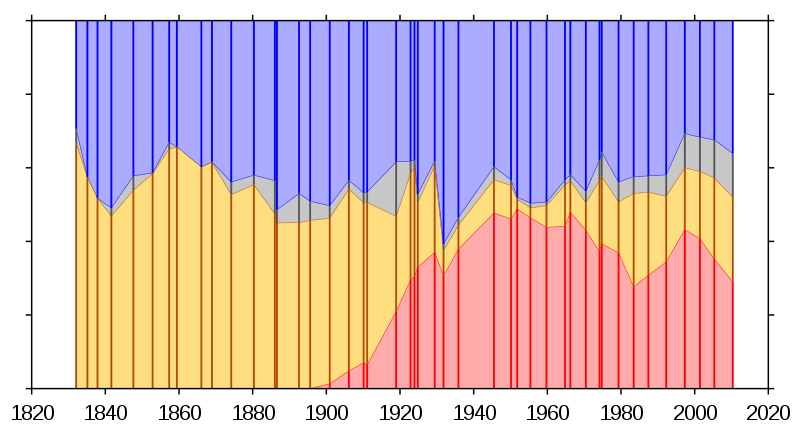 On three occasions – in 1929, 1951 and 1974- a party has secured most votes in the election, only to finish second in the overall poll. This is a system, remember, that its supporters will say should be kept because of its simplicity! On the other hand, it can also exaggerate the majorities of parties who receive the most votes. In 1983 Mrs Thatcher’s Tories won 42.4% of the votes, which earned them a whopping 61.1% of seats; the SDP, in contrast, got only 3.5% of seats with over a quarter of the vote. In 2005 Labour received 35.2% of the vote, less than 3% more than the Conservatives (32.4%) but gained 355 seats to the Tory’s 198. With turnout so low, at under 60%, Labour receieved a commanding majority with only 20% of the popular vote. No wonder people like Lord Hailsham have called this system an “elective dictatorship”. The reason FPTP produces these skewed results is because the election is fought within hundreds of constituencies. A party with a solid base in a geographical region (Labour in the North and Scotland, Tories in the South) will always outperform a party like the Liberal Democrats, which has decent support across the country, but not enough to win seats. I know so many people who are not interested in politics because they said there was no point in getting involved and learning about the different parties. The result of their election was never in doubt, because their sitting MP (usually Conservative, but occasionally Labour) had a huge majority, so they thought there was no point in voting. These seats are the twenty-first century equivalent of rotten boroughs. That where you live makes such a difference to the weight of your vote is illustrated best in the voter power tool produced at the last election: it estimated that I had 0.25 of a vote (I was one of the lucky ones, friends of mine had half that figure!). This system has led to a number of safe seats: 31 haven’t changed hands since the reign of Queen Victoria, for goodness sake. This breeds complacency, which can be best exemplified by the expenses scandal last year. To take a differnet point: Burnley, for instance, was a safe Labour seat, and because it was a safe seat its sitting MP would not listen to the concerns of local residents. The BNP vote grew in Burnley because voters did not feel their MP was listening to them on issues such as housing and education. Their vote grew from zero in 1992 to over 4000 in 2001 and 2005: a reflection of how much voters felt their MP was ignoring them. It’s not as if 4000 people in Burnley suddenly became racist in nine years. However, an active Liberal Democrat party in Burnley began to campaign against the BNP and for the needs of local residents. This year the Liberal Democrats won almost 15000 votes in Burnley, tripling their vote from 1997, to take what had been a Labour seat since 1945, whilst the BNP vote dropped by a quarter. AV would make more seats more competitive, meaning that MPs would have to take more notice of their constituents. We’d have representative democracy, in other words. That’s enough about how bad FPTP is. Its disadvantages are plain to see. Presently, two-thirds of MPs are elected with less than half of the vote in their constiuencies. What sort of mandate does this give them in Parliament? With AV, all MPs will go to Parliament with the backing of at least half of their constituents, making them representative and giving them a proper mandate. My home constituency of Oldham East and Saddleworth saw some really vile leaflets published by Phil Woolas. Some are the subject of an ongoing court case. In one leaflet he “sang from the BNP hymn sheet”, whilst in another he appears to have photoshopped armed police behind the Lib Dem candidate. These are divisive and put people off politics. Under an election held under the Alternative Vote, there would be much less of this sort of divisive attack, because all candidates would be attempting to get other participants’ 2nd and 3rd preferences. This can only be good for politics. “If you vote X, you let Y in”. How often did you see that on the campaign trail this year? Those bar charts on Lib Dem election leaflets – “Only we can win here” – can be a thing of the past (it’s worth voting Yes for this reason alone). Too often under FPTP voters need to choose between the “lesser of two evils” – do you vote with your heart, for a party you believe in, or with your head, for the anti Tory/Labour/whatever candidate? With AV, you can do both: vote for a positive programme whilst knowing you can still stop the election of a party you hate. This doesn’t mean an end to tactical voting, but under AV there is far less than under FPTP. We’d have more debate over which party’s policies were best for the country, rather than which candidate is best to tactically vote for “to keep the others out”. A key element of British democracy is the constituency link that MPs have. It’s inconceivable that this link could be abolished at present by the introduction of a “list system”. Bearing this in mind, it’s true that AV, on average, over a wide range of scenarios, is more proportionate than First Past the Post. It would mean that the Lib Dems, for instance, who at the moment are under-represented under FPTP, would get fairer representation. Mr Clegg said: “AV is a baby step in the right direction – only because nothing can be worse than the status quo. If we want to change British politics once and for all, we have got to have a quite simple system in which everyone’s votes count. We think AV-plus is a feasible way to proceed. At least it is proportional – and it retains a constituency link. Most Lib Dems would probably prefer a more proportional system, like straight PR, or even AV-plus, as Clegg says above. There are quite a few people on comments boards who are basically saying, “I am in favour of PR, not AV. So I will vote no in the referendum because I don’t want AV”. This point of view was put most eloquently by Jane Watkinson. An illusion can become a half-truth, a mask can alter the expression of a face. The familiar arguments to the effect that democracy is ‘just the same as’ or ‘just as bad as’ totalitarianism never take account of this fact. All such arguments boil down to saying that half a loaf is the same as no bread. As Nick Clegg said in the passage I quoted above, AV would still be an improvement on FPTP. I hope I have demonstrated above that AV is a better system than FPTP. It isn’t perfect, but it is a start. Jane argues that a Yes vote to AV “would hamper any future reform”. I’m afraid I would have to respectfully disagree with this. How would a No vote further the cause of electoral reform? Surely a Yes vote would do infinitely more to further the cause of electoral reform. How many times have we heard from FPTP supporters that “Nobody really cares about electoral reform” and that “it isn’t a doorstep issue”? A high turnout and resounding Yes vote next year could put those arguments to bed. To vote No, or abstain, because AV isn’t the reform system you want would really throw the baby out with the bathwater. As Jane Watkinson rightly points out, AV does not help smaller parties such as the Greens. This is AV’s main failing (I’m willing to admit it’s not perfect). However, remember that AV is not the only constitutional change being proposed. Amongst other initatives, plans will be announced earlier next year to introduce an elected House of Lords, perhaps under the STV system. In that case, smaller parties like the Greens could end up in a situation like Australia, where nine Green members in their upper house held the balance of power. Parties like the Greens, and like Labour, need to look beyond their own self-interest. AV is a once in a generation opportunity for electoral reform. We must grasp it or face more decades of a shoddy system and millions of wasted votes. This entry was posted in Politics and tagged AV, AV Referendum, Election 2010, Greens, Labour, Lib Dems, Nick Clegg. Bookmark the permalink. AV would hamper reform, as people would say that you have had your cake now eat it. It would derail reform. Look at Australia, the Greens control the senate with PR but only got one MP with AV – and AV was brought in there around like the 1930s, and has there been a change to the AV system, instead – i heard people are wanting to revert back to the old system there. Hardly a progression. The point is, I see this as a waste of time – it was a missed chance to get PR on the ballot, and regardless of any improvements, it isn’t proportional and it can be worse than the existing system, sometimes. To have STV in the Lords we need a written constitution too, as otherwise we end up with a constitutional criss – also, if PR is good enough for the house of lords, why isn’t it for MPs? Personally, I think we should abolish the house of lords and instil PR (AV+ or STV) into the house of commons – and have it as a one chamber system. Unfortunatly, I don’t share your enthuism for AV. I think it is pointless, especially when Clegg himself said it would be a miserable compromise – and it is rather pathetic and annoying, how much people are now, the very people who shot Brown down when he offered AV, are now talking it up as some great system, when in truth – it isn’t. Also, the fact that the referendum has been included in the same bill for obviously politically motivated boundary changes only makes me think again that there is nothing good or proportional about this and I’d rather it be voted down by the house of commons. And i have just noticed you remarked on Clegg’s comment of it being a compromise – despite what you say, I still think that undermines any basis of his argument that this will somehow be a great forward step in electoral change. Thanks for replying Jane. (I hope you don’t think I was picking on you by linking to your post, but your blog was the best summary of the anti-AV view thus far that I’ve read). Surely a No vote would hamper electoral reform more than a Yes vote would? I understand the point that you are making, but for the Commons at least, surely this argument is self-evident? We’re coming back to half-loaves of bread here. Say we get plans for an elected House of Lords – we’ll probably need a referendum to introduce them. Will people anti-Lords reform say there’s no point in having this referendum because people voted no to electoral reform? It would be nice if PR was the option instead of AV, but to put it on the ballot AS WELL as AV would split the pro-reform vote, which could be potentially catastrophic. Also, I wouldn’t make this about Clegg shooting down Brown for offering AV. A Lib Lab coalition was never on the cards because a) the numbers weren’t there b) there wasn’t enough support in the Labour Party. It is a logical compromise – rather than a miserable one – and aren’t all compromises here due to a coalition government, and we’d have more coalition governments if we had full PR? As for a written constitution – I agree! That’d be great. But you can’t abolish the upper chamber – you need an upper house scrutinising legislation as well. That’s another constitutional principle that needs adhering to. As a Green, would you be happy – though perhaps that’s not the word, satisfied maybe – with an AV system for the lower house and STV or similar for the Upper, which has more chance of having lots of different views? That to me sounds like eons better than we have at the moment, and the best way of securing that is to vote Yes in May. Hey, np – and no of course not, my replies politically can come across a bit too strong at times, so sorry about that – and thanks for the kind of compliment haha! I just think the referendum is the most unhelpful pieces of legalisation they could of thought of. There is no winner, either yes or no will hamper reform in some way. Also, I doubt they will put house of lords electoral reform to a vote to be honest – but if the house of lords gets pr and the house of commons gets av – then the house of lords in a perverse way will in some ways be more electable – hence the constitutional crisis! I disagree, most people aren’t really in favour of AV – the pro reform is largely for AV+ or STV or something. AV is really not any better than FPTP. I wasn’t talking about the coalition deal – i was just saying that it is rather funny to consider how much Clegg and others shot down Brown in election campaign for offering AV, but as soon as Cameron offers it its like the raison detre for the LibDems existing, well it appears so anyway. I still think that will create a crisis. Who would have more mandate, surely we would have to focus on house of lords a lot more? I disagree about the need to keep two chambers – there are many countries that have a unicameral system. Venezeula do, for example, and also a written constitution to go with it! Not really, AV will do little for us – and if that bill gets passed in the house of commons we will probably lose our one MP because of the unfair boundary reforms that will be tied to it! Nah no worries, your replies aren’t a bit strong – don’t worry lol! I’ve written before about the boundary reforms. (https://paperbackrioter.wordpress.com/2010/08/12/labour-spurns-chance-to-support-electoral-reform-bear-craps-in-woods/) They aren’t unfair. Equalising constituency boundaries isn’t unfair, and Labour will get adversely affected by these changes because at the moment the boundaries reflect them. If you still think a Yes vote will hamper reform, I’d be interested to see what you think about Sunny Hundal’s post in favour of AV – that incremental reform could be the way to go. http://brightgreenscotland.org/index.php/2010/09/sunny-hundal-why-greens-should-back-av A change, no matter how small, is still a welcome one. 2 Chambers doesn’t automatically mean a constitutional crisis. I’m sure there will be provisions brought in to deal with any conflicts between Commons and Lords. Really not sure, with the greatest deal of respect to Venezuala, whether they should be used as a constitutional model! And thanks, glad I wasn’t! Yes, but there are elements of bias to it – they are using an outdated record of electorates if i remember rightly, where many electorates will be missed out. And its clear these reforms are done merely to benefit the Tories. I will give Sunny’s blog a read soon! I don’t know about you, but I often feel like I have reading come out of my ears ha! Well what are you going to do if the Lords starts saying they are more of a representation of the people? Are the House of Commons going to be undermined as the main chamber of debate? And safeguards to make sure this doesn’t happen would be a constitution, which doesn’t look likely at the moment. Anyway, watch this space, as AV myth busting coming to a blog near you haha! I’m on the New Statesman website! Not Enough Champagne Episode #10: Too many tweets make a what?